A fun and realistic video game where you get to spend time living the life of either a painted or a Blanding's turtle. Complete a variety of missions, all while trying to avoid threats and predators. If you are a good enough player, you will become a certified turtle expert. This game is an excellent way for children to better understand many of the science-based concepts taught in the Ontario curriculum. Children of various grade levels can link the concepts and themes in the game to the learning strands and expectations that are part of their education. Ontario's turtles face a variety of challenges. Some are naturally occurring such as the threat of predators and fluctuations in local weather patterns. Other threats to turtles are human-induced and include wetland pollution and degradation, habitat fragmentation and sometimes, deliberate persecution. This educational video game is designed to allow you, the player, to spend a day living in a turtles' shoes. It will take you through the typical activities of a turtle based on the seasons, spring, summer and fall and highlight the obstacles turtles overcome on a daily basis. 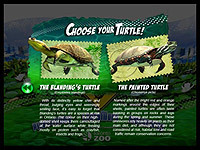 Information bubbles pop up at various points in the game to provide extra facts about Ontario's turtle species and the threats they face. In preparation for this interactive game, try some of these activities from the Turtle Curriculum. 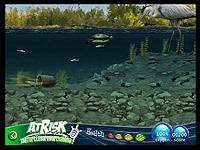 The activities will help you to learn about turtle ecology and get you ready to play the role of a turtle in the game. So you have now spent some time as a turtle. Whether you played as the painted turtle or the Blanding's turtle, you now have a better idea of the kinds of things turtles do in their daily lives as well as the threats they face. The question is what to do with all this knowledge? How can you help turtles in their plight for survival? Although some of the threats turtles experience may seem almost too big to handle, there are plenty of things you can do to lend a hand. These activities from the Turtle Curriculum will help you use the information you learned in the game. Here are some more fun activities you can do to raise awareness about Ontario's turtles and make a difference in your local environment. Design a game about Ontario's turtle species. Highlight some of the same elements as in 'At Risk' i.e., Predators, invasive species, food, habitat, roads etc. Participate in Ontario Turtle Tally - visit www.torontozoo.ca/adoptapond for more details. If you see a turtle on the road in the spring or summer and it's safe to do so, help it out by taking it across the road in the direction it is headed.